DinosMaps is a young, enthusiastic company whose primary aim is to provide the children and all those who feel young at heart with beautifully designed, educational and playful maps. A various range of maps are offered to children. A lot of work, effort and knowledge is put in every our map. In all our projects experts in Geography, History, Ethnology, Biology, Geology, Paleontology, Architecture, History of Arts and similar fields participate actively in creating a product of the highest possible quality. 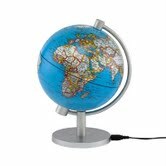 Mini Illuminated Globe: A dark blue ocean and two levels of map detail make this 5-inch illuminated globe a great addition to any room. Light up the room with this quality mini-globe from German manufacture Stellanova. It features two view of the earth; one viewable when lit and the other viewable when it’s not illuminated. When the light is on, you see the physical earth, and when the light is off, you see the political world. The Stellanova 5 features an AC adapter with a detachable cord, and an on/off switch. It comes with an easy to replace standard light bulb, and a stylish & stable weighted base. Children's USA 500 Piece Jigsaw Puzzle: This colorful informative United States map puzzle is made especially for children. Heavily illustrated with fun pictures, icons and descriptive text, this puzzle can keep children entertained for hours. The illustrations depict where mountain ranges, deserts, seas, etc. are located and what types of animals can be found in each region of the USA. Not only is this puzzle fun to build and fun to look at, but it is educational as well. Adults and children of all ages (designed for ages 7 and up) will enjoy the fun nature of this one-of-a-kind and unique puzzle of the United States. Children's World 500 Piece Jigsaw Puzzle: Produced by the same company as the USA puzzle above, this world map is also heavily illustrated with pictures, icons and descriptions created to entertain. WIN: 24/7 MOMS and Maps.com are giving away Mini illuminated globe, Children's world puzzle and Children's USA puzzle. 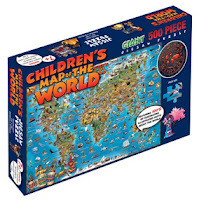 * We received a complimentary Mini Illuminated Globe, Children’s USA & World 500 Piece Jigsaw Puzzles for review no financial compensation was received. My daughter is in third grade and would love this stuff!!! I am already a subscriber! My daughter is in 3rd grade and would love for Mommy to win this stuff for her!! I am already an email subscriber!! I liked Daily Mom Deal on Facebook. I am a subscriber. This is my sons new interest, what a great giveaway! # Like 24/7 MOMS on Facebook. Like Daily Mom Deal on Fb as sylvia b.
Super neat giveaway! Already a subscriber. Following Daily Mom Deal on FB. I LIKE Daily Mom Deals on Facebook. I subscribe on FB and email. The puzzle would be fun with the family. I like you on facebook as kerrie mayans. I like Daily Deal Mom on facebook (kellie conklin), thanks! I am a subscriber. The kids would love these!